Umeshu comes iunder different guises in Japan, but if you buy one instead of making it yourself make sure you buy one brewed by a reputable Brewery! In Shizuoka Prefecture, umeshu is an extravagant affair when made by the local breweries. Sanwa Brewery in Shimizu Ku, Shizuoka City is no exception! 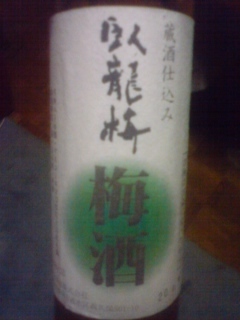 Ingredients: Japanese Plum (“Ume”), Sake. Sugar. Aroma: Ver fragrant and sweet plums. Taste: Dry attack, turns sweet later. Shortish tail. Very pleasant impression. Elegant. Overall: Very enjoyable and easy to drink. Makes for a great aperitif when chilled. Great with cheese at room temperature. Elegant beverage. Should please both ladies and gentlemen! I already the occasion to taste this new umeshu (“Japanese plum liqueur”) callled “Umemaru” when I visited Shidaizumi Brewery in Fujieda City last August before it was put on sale. But due to a hectic schedule before leaving fro France, I did not have the time to make any report. The alcohol contenet is not so high at only 11 degrees. I would like to thnkx for the efforts you have put in writing this website. I’m hoping the same high-grade website post from you in the upcoming also. In fact your creative writing skills has encouraged me to get my own website now. Actually the blogging is spreading its wings quickly. Your write up is a good example of it. To be sure completely with all your conclusions and feel that you’ve made some excellent points. Also, I’m keen on design of your respective site and also the simplicity of navigation. I’ve bookmarked your site and definately will return often!